Hey guys! Today we’re going to be talking about a skill that will help beginners and experts alike: reading your opponents hand. 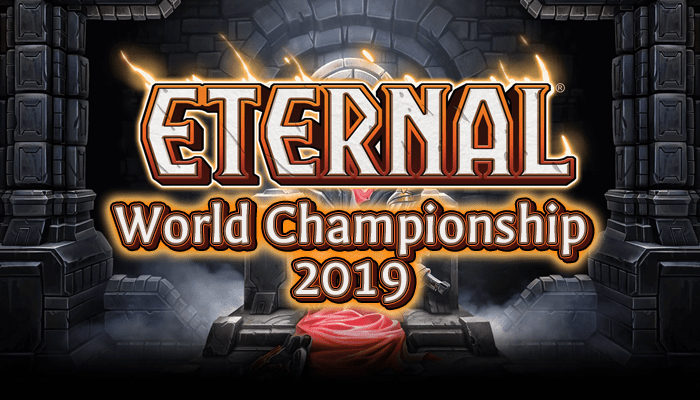 Eternal is a game where knowledge of your opponents hand can be a game-winning proposition – being able to outplay their tricks, save removal for their best cards and Backlash where it counts are all key elements. In most CCG’s, you’ll often see high level players call out cards before they are played to a surprisingly high degree of accuracy. Without aiming too high, let’s talk about the primary ways that we can achieve that level of prescience through Tools, Tells, and plain old logic. In order to magically determine the things that we don’t know, we must first evaluate what we do know. What colors of cards has our opponent played? If there’s only two colors, we’ve already narrowed the possibility space on our opponents hands to about 2/5ths of the total card pool. Good work! Now, did our opponent play a mean 1 drop? Great, their deck is aggressive. That means they’ll be playing a lot of scary two-three drops in their colors, of which there are only so many that are good right now. You can make a fair guess as to what cards you’ll be seeing immediately. If they don’t play a one drop, the jury’s still out on what kind of deck it is, but if they don’t play a two drop, they’re probably playing something slow. What if their one drop was super passive like Blind Storytellter, or just a draw spell like Levitate or Inspire? Well, that tells us a little bit about their tempo. But we can learn all sorts of things from the first card played. Let’s look at those three one-drop examples in turn: What kind of synergy does each card have? Inspire is usually a dead giveaway for relic weapons, because it’s aimed specifically at buffing things but doesn’t really care about developing the board. Levitate can be used to pop Aegis, so it’s used in a lot of control archetypes – but it’s most common as a way to get cards across in Haunting Scream decks, like Direwood Beastcaller and Gorgon Fanatic. Blind Storyteller likes to discard things, which means you’re going to see cards that like it when things are discarded, like Herald’s Song, Privilege of Rank, Ephemeral Wisp or Grasping at Shadows. Here’s an easy one: Your opponent attacks with a 2/2 into your 3/5. Does he have a combat trick, like Rapid Shot or Finest Hour? Maybe, just maybe, he’s bluffing, but that’s a pretty high risk maneuver for 2 damage. More likely you should assume that he has that card in hand and play around it. For every piece of information you have, you narrow the space of your opponents deck considerably. There’s only so many good things they can play, and even better, a lot of those good things are stock lists that are posted on places like RNGEternal.com. This means that you can make educated guesses with surprisingly little information, and predict the future with eerie accuracy with a lot of experience and practice. Of course, the more information you uncover, the better off your guesses are. That’s why we need to look at toolkit cards that actually give us a peek at the opponents hand, and also learn to recognize built-in tells in the Eternal system. First off, cards like Sabotage and Treachery will give you an exact read on some of the most important cards in your opponents hand. Sabotage tells you all the attachments (relics and weapons) and spells in your opponents hand. In addition to providing perfect information about these cards (and trading one card for one card in doing it, if your opponent has even one of the cards you’re looking for) they also tell you a lot about the overall composition of a hand. For example, if a Sabotage hits a single card in hand, your opponent clearly has a high density of units and power. If he misses power drops, you’ll know his hand is almost entirely units and can play around that idea. Strike that and reverse it for Treachery. The cards Slow and Rain of Frogs, which pick both units and spells, are total information engines. The only thing they won’t tell you is the exact type of power cards in your opponents hand. Remember that if you have more than four valid targets for one of these cards, you aren’t seeing the whole picture. Like when searching your deck or void, you have to press the arrow icon that shows up to the right to see the entirety of your opponents hand, which you absolutely should do even if you know exactly what you are going to pick. It’s easy to get excited by a big card in your opponents hand and click on it immediately, but holding off and checking to make sure you have a full read on their hand will give you a better idea of what’s going on. In addition, cards like Pilfer, Subvert, and Cabal Recruiter will give you information not about your opponents hand, but about the contents of their deck. By playing cards like these, we can bring key information to light, like what colors they are running (especially important if they haven’t played all of their influence yet) or what combo pieces they are trying to hide. There are disadvantages to these cards, of course: all of them represent tempo loss on board, in that they don’t solve problems that have already been created for you. With the exception of Slow, Treachery, Sabotage and Rain of Frogs, none of these cards see very regular play, though most of them are at least passably strong if your deck needs a few tools to spy (Subvert, in particular, is heavily underrated, especially in Draft). Just don’t go too overboard on them – 1-2 will usually do of any one kind. If you’re excited about using this information to your advantage, I recommend even writing down the cards you see on a pad of paper next to you. A good memory will serve you fully most games, but every now and then a card will linger in an opponents hand for a long, long time and it might be worth having a note of what’s in or out. In a physical game like poker or Magic, you read your opponents face to help you figure out what they might have in hand. Personally, I’m not much for reading peoples faces, and we’re fortunately never gonna have to do that in Eternal. Instead, Eternal has a number of built-in tells to indicate key bits of information. These are the most important things to learn to read. A mildly important tell is what cards your opponent mouses over in their hand, but be wary of using this to determine information as it is by far the area where you will see the most bluffing. Cards that your opponent is mousing over will be highlighted. Overall, I wouldn’t rely on this heavily, but you can get some idea of the psyche of an opponent by how they mouse over their cards. Importantly, cards that are drawn into hand are invisibly shuffled. Don’t think that just because your opponent is mousing over the rightmost card in their hand that they are mousing over their topdeck. Was that a Torch? I think that was a Torch. Here’s the key tell to understand in Eternal: At any time when an opponent is able to play a fast spell or ambush unit – which is to say, they have both the power and a valid target – the priority to play will pass to the opponent and they will have to choose to pass it back by pressing “Continue”. This initiates an intentionally designed, unavoidable pause. Sometimes opponents will pass priority fast, but even then, you can see the pause if you are looking for it. Once you see the pause, you can make educated guesses as to what is in their hand based on how much available power they have. If it’s in the 1-2 range, there are only a few options per color that are playable. For Rakano, for example, it is almost always Torch or Finest Hour, very rarely Protect, and never Detain unless you are in some sort of Draft environment. If you didn’t get the pause at 1-2 but you’re getting it once the opponent has 3-4, then there’s a high chance its a spell of that cost (and a low chance it’s a topdeck). For example, a Feln deck that never pauses until 4 is likely holding Deathstrike. If the pause doesn’t happen in combat, but does happen at the end of your turn, it’s an Ambush unit, which only has the opportunity to be played at the end of turn (cards like Storm Lynx and Desert Marshal which are easily identifiable at 2 due to their dual influence cost, or Scorpion Wasp and Cabal Countess at 3 in their respective colors). Once you know these cards are in hand, you can make smart decisions about what cards to play out with the expectation that they will be answered in a specific way. One small hitch: There is a thing called Smart Autopass which will automatically pass priority for spells that are not relevant. For example: it won’t show a pause for Finest Hour if your opponent has no units to play it on, even though he could technically target your unit. High level players virtually always have this off because Smart Autopass negates bluffing opportunities and can interfere with useful responses (like, say, being unable to Annihilate your own Umbren Reaper in response to a lethal burn spell, which actually ended up losing someone a tournament game way back in closed beta). Just keep in mind that newer players will play with this on, as that is the default setting in Gameplay Options. Also: turn Smart Autopass off at the first opportunity! This is so you, too, can threaten your opponent with a menacing pause when all you have in hand is a Protect and a prayer. This one’s usually a gimme, but it’s important to remember that every time your opponent draws a Fate or Echo card, something happens. Keep an eye on your opponent when he draws – if the card splits into two, that means it is either a card with Echo or Jotun Hurler, which draws a Snowball. There are only a few of these cards that are played: Unstable Form, Herald’s Song, Pteriax Hatchling, Clockroach, Twinbrood Sauropod, and Thunderstrike Dragon, and almost all of them are played in different decks. Is there a Crown? Bet hard that it’s Clockroach. If you see a discard outlet, you can be pretty sure it’s Herald’s Song. If you see North-Wind Herald, it’s probably Unstable Form. If the deck is Elysian with Initiate of the Sands and a lot of Time, it’s probably Sauropod, and so forth. Know the possibility space and keep an eye out for these effects! Likewise, Fate effects that trigger (Curiox, for example) will show you the card, so write it down or remember that it is there so you don’t get bamboozled by it later. A final key thing to recognize is that what kind of power your opponent plays will give you a very good idea of what’s in their hand. For example, a depleted Seat on any late game turn usually indicates that your opponent is completely out of power, and all of the cards in their hand are units, spells or weapons. If your opponent stops playing power before 5 power, they likely don’t have any power left in their hand, making them a ripe target for Subverts, Slows, and Rain of Frogs. A banner played depleted late probably indicates no units in the hand. Also, if you see a depleted monument, you’ll know to expect the transformed version of that card in later topdecks! Power also strongly indicates what kind of deck your opponent is playing – what colors they want to hit and how aggressive they are. A deck playing Diplomatic seals probably has no cards with four or more influence symbols in it, like Icaria or Deepforged Plate. A deck with both Seats and Banners might be trying hard to hit exactly those cards. You can look at what kind of power your opponent has played by clicking on the area where their used/maximum power is located. This summary includes whether or not the power was played depleted. Total information isn’t always going to save your life, but it will allow you to play smartly and win a larger portion of games. For example, if you’re itching to play an Umbren Reaper but you know your opponent has Annihilate in hand, you might choose to play a tempting monocolored unit instead of a dual-colored unit to bait that removal out. Knowing about Finest Hour in a Rakano deck may mean that you choose to race your opponent to lethal damage instead of to trade units and spells with them. This kind of info is also crucial to your overall strategy. If two aggro decks go up against each other and one of them identifies that they are the slower deck, they can play defensively to take advantage of their higher quality cards instead of just rushing blindly in and losing the race. Knowing you’re up against a Stonescar Burn deck early means that you’ll make it a goal to keep your life total high, out of range of Flame Blast – or if that fails, Obliterate – or if that fails, at least Torch. So, make it a point to start guessing at what’s in your opponents hand and what they are going to do. You won’t be right all the time, and as you’re just getting started, you may not even be right most of the time. But I guarantee you will win more games if you think actively about what your opponent is doing behind the curtain. For some demonstration of how to visualize your opponents hand using what we’ve learned here today, you can check out our newest Eternal Basics video. Until next time! Great article! But I think you slightly messed up your description of ambush units. If they have an ambush unit, there WILL be a pause during combat, but not in response to a spell/ability, for example.